An action-oriented design thinking course, tied to a challenge for local impact. The Do Tank is an action-oriented design thinking course, tied to a challenge to translate learnings into local impact. The Do Tank cultivates a group of people with varied skillsets to work together on a real-world issue, from collaborative ideation to collaborative creation. 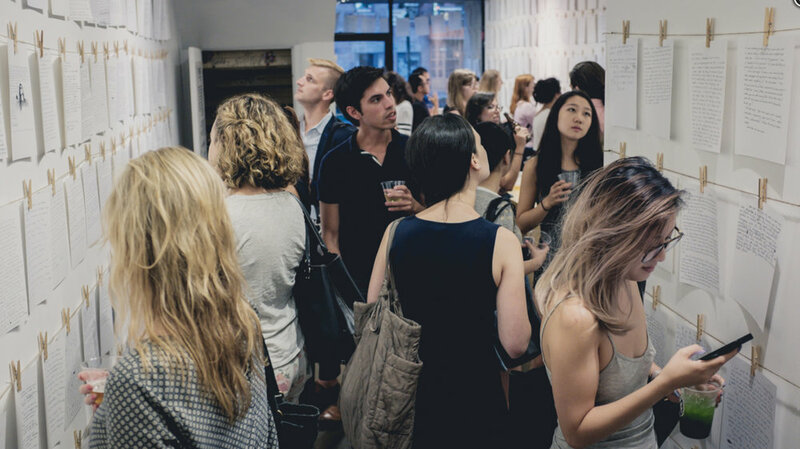 This half-day workshop or full-day bootcamp for young professionals and graduate students is facilitated by design and innovation experts from Foossa, MILES, Parsons School of Design, and more. With their support, Do Tank participants are guided through a design process which goes through the phases of research and discovery, ideation and prototyping. These are public sessions where where participants will be freely jamming ideas and for the Storefront for the Commons. These are free of charge! More about these sessions here. More info about benefits and learnings here. T-shaped people have two kinds of characteristics, hence the use of the letter “T” to describe them. The vertical stroke of the “T” is a depth of skill that allows them to contribute to the creative process. That can be from any number of different fields: an industrial designer, an architect, a social scientist, a business specialist or a mechanical engineer. The horizontal stroke of the “T” is the disposition for collaboration across disciplines. It is composed of two things. First, empathy. It’s important because it allows people to imagine the problem from another perspective- to stand in somebody else’s shoes. Second, they tend to get very enthusiastic about other people’s disciplines, to the point that they may actually start to practice them. T-shaped people have both depth and breadth in their skills. Bustling storefronts have long been a fixture of vibrant urban spaces. A storefront is often more than just a storefront. Neighborhood institutions like bodegas, barbershops, cafés and the like serve as places for social interaction and civic engagement. Coffeeshops and restaurants have become makeshift co-working spaces reflecting the present and the future of work. Shop windows serve to entice customers but also as canvases for artists to inspire and provoke. Even as online shopping gains more and more marketshare, online-first retailers are recognizing the importances of brick and mortar shops as showrooms and brand showcases. We are seeing new forms of storefront uses emerging : a bookshop sharing space with a boutique, a barber shop and a coffee shop co-existing side by side, temporary use of spaces taking over empty storefronts and lots, and many more. Are these new forms of uses here to last or just another trend? While consumer trends and neighborhoods change, storefronts remain as important as ever. How might we use a design and futures-thinking perspective to (re)imagine these important “third-places”? How do we design the future of storefronts as more than just retailing but also places of socio-economic production? How to we use design-thinking to conceive of inclusive ways to design and sustain commercial real estate? We were inspired by the OpenIDEO approach of activating citizens' idea through challenges that tackle social problems around the world. The Do Tank is an effort to encourage more physical action, beyond the ideation phase. We aim to help move ideas into prototypes that can potentially be implemented with local organizations. The Do Tank itself was first prototyped in Fall 2015, in partnership with OpenIDEO and NYU Tandon School of Engineering. Along with instructors from FOOSSA, NYU, IDEO, and miLES, we mocked up a curriculum that combines Design Thinking, Prototyping, Lean Startup, and Pop-up Experience as the Do Tank Educational Program. This is the 4th iteration of the program and we would love to continue the experimental and prototypical approach of working with design-centric and socially-minded individuals to create local impact. We will be hosted at Prime Produce, a guild for social good at 424 West 54th Street this year.